Submit a short film for a chance to make a film produced by Justin Lin. Hey filmmakers! 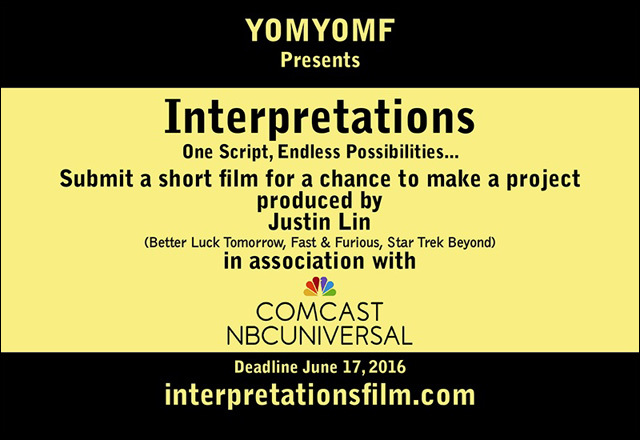 Justin Lin's YOMYOMF recently announced the relaunch of the "Interpretations" short film initiative -- a unique filmmaking competition to find the next generation of Asian American filmmakers, in partnership with Comcast and NBCUniversal. The challenge: produce and shoot a three-minute short film using a prescribed four-line script. For this edition of the initiative, the four lines are supplied by one of our greatest American writers, none other than acclaimed Tony Award-winning playwright David Henry Hwang. And that's it. That's the dialogue. It's your job to "interpret" these lines however you wish. Everyone gets the same four lines, in that exact order, and you can't add any additional dialogue. Now get creative. Three winning filmmakers will have an opportunity to produce a project for one of the Comcast or NBCUniversal platforms under the mentorship of Justin Lin and other industry professionals. The official call for entries begins March 31 and runs through June 17. Judging will commence in July and August. The Top 15 will be anounced on September 6, with online voting kicking off that day through October 6. The final three winners will be announced online on October 10 and they will be invited to attend the NBCUniversal Short Film Festival on October 19 at the Directors Guild of America in Los Angeles. Participants must be a resident of the United States of America and at least 13 years old. More here: Here's the Interpretations Script!